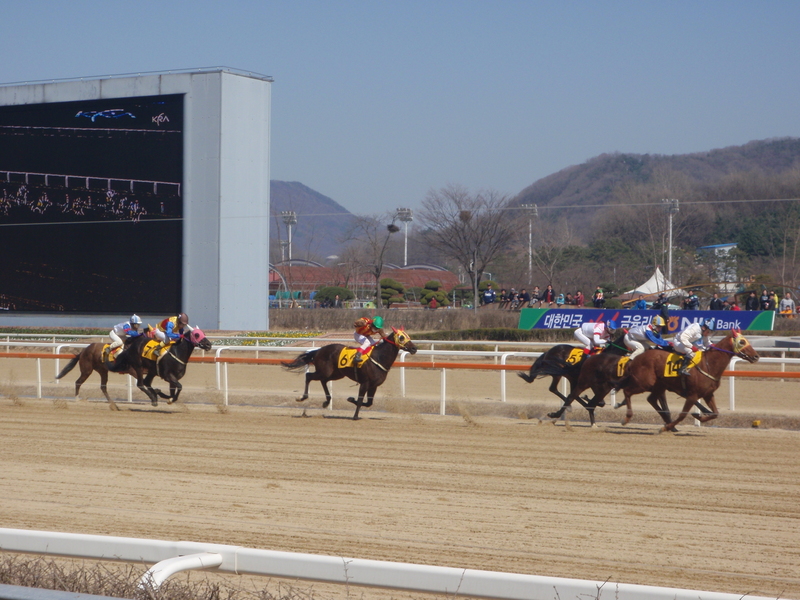 After a month in Seoul and plenty of football it was time for a bit of variation so I thought I’d have a day at the races. South Korea has three racetracks, one of which is quite close to me in Seoul and so that seemed like the sensible place to start. The other two tracks are in the south of the country and I’ll no doubt get along to them at some point in my stay, hopefully, if my experiences so far are much of a guide, combined with a trip to a football match watched mainly by the player’s families and then a festival of arm wrestling rabbits. Gambling seems quite highly regulated here, or at least it is on the internet where my Cheltenham winnings remain untouched due to me not being able to access my Victor Chandler account. Still, I suppose it stops me ‘re-investing’ them. They do have betting shops here though, I passed one a couple of weeks ago whilst walking in Seoul on a Sunday morning. It was a hive of activity outside, with plenty of punters arriving and about a dozen pavement sellers trying to persuade them to buy one of the many form guides that were available. Anyway, good as it would have been to idle away a couple of hours in the betting shop, I’d rather be doing my idling at the track itself and so on Sunday morning I made my way on to the subway. The station that I was heading for is only eight stops and one line change away from me and is perfectly named as Seoul Racecourse Park. I like it when the authorities help you out by naming the station after the reason for going there. How much easier for visitors would it be if we had tube stations in London named Houses of Parliament or Buckingham Palace? They could also add a picture or symbol of what’s there to the name of the station on the tube map. Wembley gets a drawing of the new stadium for example, Trafalgar Square is denoted by Nelson’s column and so on. It would be so much easier for those unfamiliar with the network or unable to read English. The correct stop for a football club could be indicated by a picture of a player wearing the team colours and for those unsure of the strips there could be helpful extras. The Arsenal figure, for example, could perhaps have his lower leg hanging at a right angle to the upper part. Shepherds Bush could have the BBC logo or more imaginatively perhaps, a nudey still of Jacy from the skinny dipping scene in The Last Picture Show. Barking, to its shame, gets a burning cross. 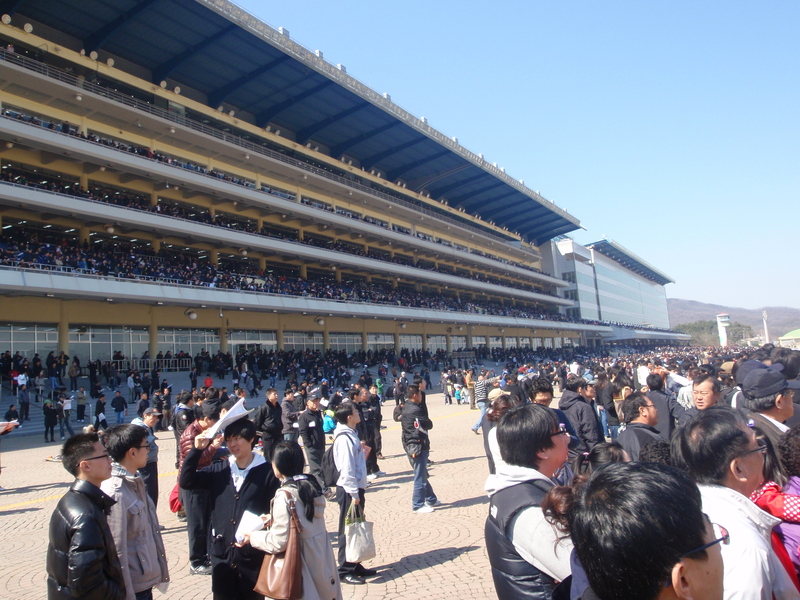 Once I’d changed to the line for Seoul Racecourse Park the train was a whole lot busier and it was apparent that there was going to be a bigger crowd watching the horseracing than I’d encountered at any of the football games I’d been to so far. We were that tightly packed in on the train that I didn’t need to hold onto one of those hanging straps. If we changed pace suddenly, it didn’t matter, we were too tightly packed for me to fall or even move much. Amongst the punters were quite a few hikers heading for the hills south of the racecourse, walking poles strapped to their rucksacks which often came perilously close to having someone’s eye out. When we reached our stop we unavoidably burst out of the door, sweeping one of the hikers out with us against her wishes. I’m sure I saw her and her rucksack three races later still trying to fight her way against the tide of racegoers. The station was extremely busy and I had to queue to get out of the exit turnstiles. There were lots of people selling the form guides, some from little stalls inside the station, others lining the stairs on the way out. Most of them seemed to be trying to gain our attention by shouting at the tops of their voices. I bought one of the guides for 1000 won, selected more for its relatively small size than the noisiness of its seller or any confidence in the merits of its selections. 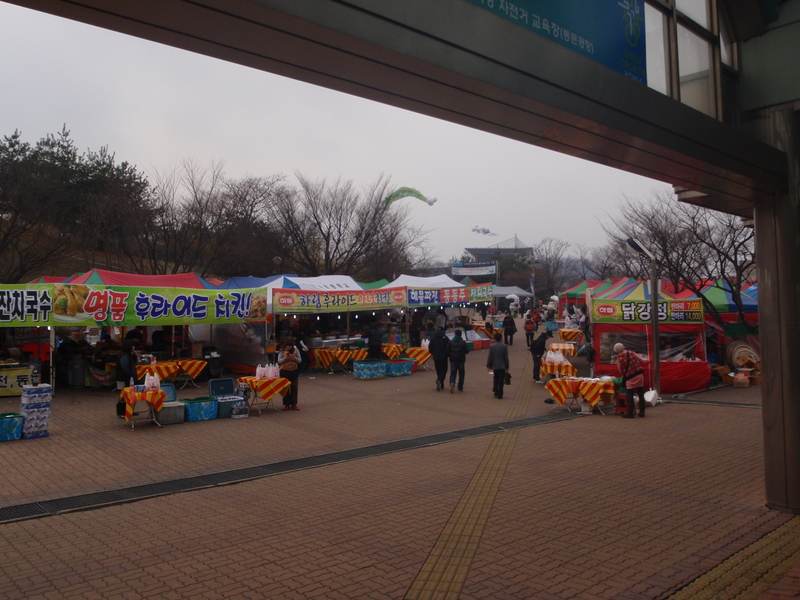 Outside of the station there were more vendors, some of them selling recently cooked silkworm pupa, others trying to convince people to buy racing tips handwritten on scraps of paper. I smiled at that, not the silkworm pupa; I’d need plenty of drink inside of me to be smiling at them, but at the blokes selling their tips. I’d done it myself as a teenager outside of Thirsk races. A mate and I picked a horse at random, Fairways Girl was its name and it was running in the 3.45. The reason I can remember all these years later is because we wrote its name down a hundred times and put each one inside an envelope. We then turned up early at Thirsk races to sell them as ‘genuine stable tips’ for a pound a time to arriving punters who would be funding our day out. Or not. We spent two hours approaching anyone who looked like they had a pound and managed to sell a total of three. The paper and envelopes cost more than our takings. As we hadn’t sold enough to pay for our admission we had to turn around and head for home without even getting into the course, never mind having a drink and a bet. And what of Fairways Girl? Well, the three generous punters who took pity on us will have been delighted when it won at 7/1. We didn’t even have enough faith in our selection to risk the three quid takings on a bet so it was a bitter-sweet moment as the results came through. I gave the blokes selling the tips a knowing look and hurried on towards the course. It was only about five minutes along a covered walkway to a few entrance gates where I paid 800 won to get in. That’s about fifty pence and to put it into perspective about a tenth of the price of getting into the football over here. It’s no wonder the crowds are so big. The course was built for the equestrian events at the 1988 Olympics and then redeveloped for racing shortly afterwards. I often hear comments in the media about the legacy of the Olympics and I wonder what, if anything, will be in use in the UK after the 2012 Games apart from possibly a new stadium for West Ham. If it gets a new tube station as well, they could use a photo of Tevez as their symbol so that nobody forgets the outrageously favourable treatment they received from the FA. 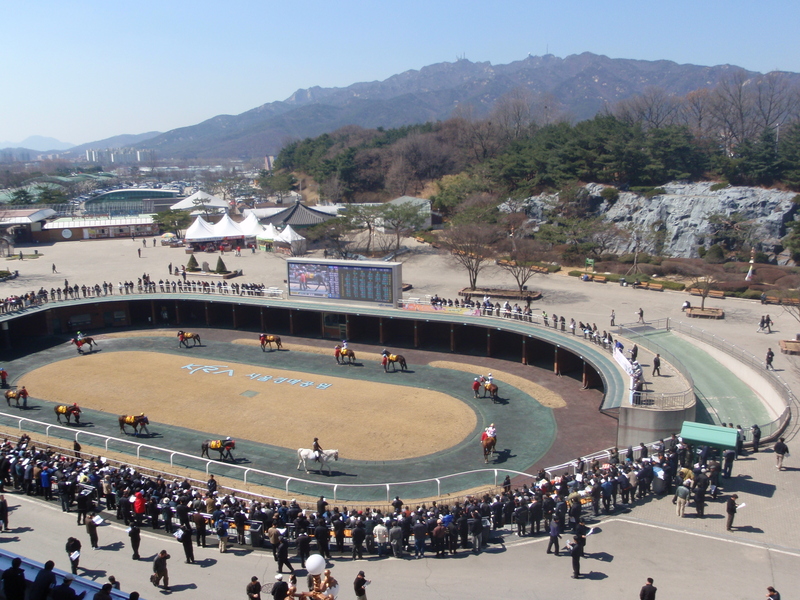 Despite Seoul racecourse being over twenty years old it still looked very modern to me, possibly because we don’t really have up to date racecourses in the UK. Or at least if we do I’m not really aware of them. I go to the Grand National most years and they have very impressively added a few new stands over the years, but most courses that I’ve visited around the country don’t seem to have changed much since I first started going thirty years ago. That’s not a criticism by the way, just an observation. The last thing I’d want is the character of some of those old courses changed beyond recognition. Seoul racecourse seemed more like an airport terminal than a racecourse. Apart from the dirt track, which I suspect most planes would struggle to take off from. And the horses, I rarely see many of them cantering around baggage return at Durham Tees Valley. So not very much like an airport terminal at all I suppose apart from the grandstands which were enormous glass fronted buildings, at least five storeys high. I passed the parade ring and went into the first grandstand. It seemed just as modern inside with lots of seating, plenty of big screens, convenience stores, banks and betting windows. A nice little touch was the provision of tables, scissors and glue, where punters were going through the dozens of different form guides and compiling their own comprehensive booklet, Blue Peter style, for the days racing by cutting out the relevant bits, gluing them together and throwing away the bits that they didn’t want. I was impressed by the views of the track too. The glass front meant that you could see the racetrack from just about anywhere inside the building without the need to pay extra to access somewhere where you could actually watch the race. I went to the Arc de Triumph in 1987. It was the year when Reference Point was supposed to romp home, but that’s another story. The point is that despite some impressive stands, the only place I could see the Arc from was outside at ground level. Here you could watch from comfy chairs inside, which a lot of people did, taking at least two chairs to accommodate all of their form guides, or you could go out onto the rows of seats outside that were situated at each level and watch in the fresh air and as high up as you liked, all for the same fifty pence that got you admission to the track. The track had a backdrop of hills a bit like Hexham, which is probably my favourite UK racecourse, or Santa Anita in America. The track was definitely more Santa Anita than Hexham though, being a dirt track rather than grass and without any jumps. I went to Santa Anita for the Breeders Cup a couple of years ago and managed to have a close look at the running surface. It was weird stuff with a texture somewhere between loft insulation and belly button fluff. One notable difference between Seoul and both of those tracks though was that you couldn’t consume alcohol at the Seoul track. This surprised me as there appeared to be no restrictions on drinking at the Korean football games. At the matches that I’ve been to so far you can drink at your seat if you want, bring in your own crate of beer or bottle of soju and I’d be surprised if anyone would raise as much as an eyebrow should someone start up a home brew kit behind the goal. None of that at the racetrack though, it was strictly soft drinks only. There were eleven races scheduled between 11.20 am and 6pm. They were quite unevenly spread out, with as little as twenty five minutes between races at the beginning and end of the day, but with up to an hour between the races that took place around lunchtime or teatime. The distances were all listed in metres rather than furlongs and ranged between 1000 metres and 2000 metres. I wandered about the various floors for a while before finding a lounge on the fourth floor specifically dedicated to foreigners. This was a great idea, keeping together in the same place all of us idiots who couldn’t read Korean and who were quite likely to try and put a bet on at a window selling ice creams. You had to show your passport to get into the foreigners lounge, but once in you got a reserved seat, a form guide in English and a leaflet, again in English, that showed you exactly how to complete a tote slip for the various bets and then what to do with it. I don’t recall ever seeing much guidance in the UK for people not too familiar with betting, never mind those who don’t speak the language, so I was both impressed and grateful. I successfully managed to place my bet for the first race, avoiding the favourite who was untried over the distance. This was a wise move as after leading the race all the way around, it ran out of pace toward the end and was caught just short of the winning post. Not by my selection I must add, which had somehow contrived to toss his jockey off coming out of the starting stalls. That phrase might just get me a few hits in Google. After another couple of losing bets I went for lunch after the third race, as they had very kindly built in an hour before the start of the fourth race. I had beef that tasted very much like the beef that you get in the Chinese at home when you order beef in oyster sauce. I don’t know if the sauce here was oyster or not mind, but it was ok. I had it with boiled rice and Kimchi. After lunch I finally got my first winner in the fourth race and then decided to take a stroll through a tunnel that went underneath the track and have a look at the area in the middle of the circuit. It was just like walking around in a park. There were families having picnics, children’s play areas with swings and slides and small kids riding around on hired bikes and trikes. All that was missing for the full Ropner Park experience were the burnt out cars and the dogshit. It seemed a very nice place to spend a family afternoon even if you had no interest in horse racing. When my kids were little I often used to take them to the races. It was a cheap day out as kids got in for free. 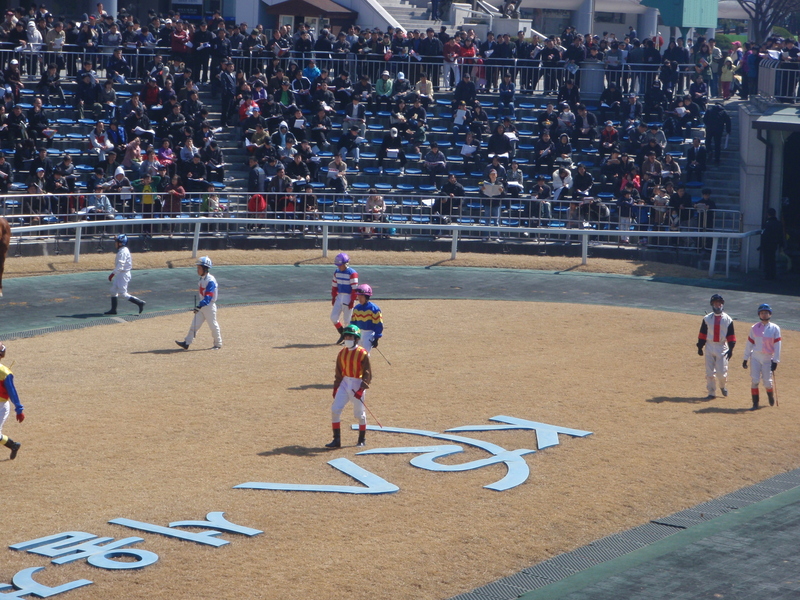 We would usually watch the horses walking around the parade ring and then go right to the front and watch the horses from the rails where if they ran down your side of the track you could hear the hooves and feel the vibrations as they ran past, Invariably we would take a football and have a kickaround like some of the families at Seoul were doing. I have a photo somewhere of my son aged about four stood between our makeshift goalposts, one of them the traditional jumper, the other one the not so traditional younger sister asleep in her pushchair. As well as the families, there were a few groups of teenagers having a laugh on the grass and a group of old blokes in hiking gear sneakily swigging from illicit Soju bottles. I did wonder if they had been swept off the train that morning or whether they regularly left the house telling their wives they were going for a nice healthy hike before getting off a few stops later to meet their mates at the races instead. I had one more winner before calling it a day after the seventh race, the one hour gap to the eighth making it a good time to head back into the city. There were still people coming into the track as I left, having had their Sunday dinners before deciding to round off the afternoon with the last four races. It was still good value for fifty pence. The blokes selling the racing tips had gone by then though, hopefully having done a little bit better than I did all those years ago at Thirsk. After watching the National League game between Incheon Korail and Yesan, I had an hour to spare before the match between Incheon United and Ulsan Horang-i kicked off and so I walked back around to the front of the stadium to get a ticket and something to eat. The baseball match that I had passed on the way in had just finished and plenty of the fans from that game were still milling around, reliving the match and not quite ready to go home. A lot of them, particularly the groups of young lads, or the father and son combos, were throwing a baseball between them, usually managing to catch it in their baseball gloves. They weren’t always successful though, quite often a throw would go astray and the ball would either bounce off into the distance with a small child scurrying after it or else it would clobber an unsuspecting passer by as he made his way towards the subway. I found myself having to watch a number of balls simultaneously in an attempt to avoid being knocked spark out by an errant return. Having passed up the opportunity earlier to get something to eat at the station, I had a look around the outside of the stadium for some food. The best that I could find was a stall that served something about the size and shape of a fun size Mars bar, but with the texture of a marshmallow flump. I was given a large paper cup with about eight of them in, submerged in what could possibly have been some sort of stock, but might just as easily have been simply hot water. They were beige, tasted of nothing and were hot enough for me to burn my tongue. I doubt Ronald MacDonald would lose any sleep over them. Generally I’ve enjoyed the Korean food I’ve had so far in my time here. I eat in my works canteen every day with a colleague, Mr. Park, and with neither of us being particularly faddy eaters we always just take pot luck and join the shortest queue. This means that we don’t find out what we are going to get to eat until we reach our particular serving counter. It works pretty well and I haven’t had a bad meal yet. There’s usually a main dish, perhaps some bits of fish, squid or meat, a bowl of very watery soup and a few side dishes of rice, bean sprouts, seaweed, radishes etc. It’s usually all very spicy with the exception of the boiled rice. The other day I started eating what I thought was seaweed, but Mr. Park pointed out that they were fish, undoubtedly the tiniest fish I’ve ever seen, never mind eaten. If you, or your children or your dog has ever had worms, you know, those little white things that don’t seem to have a head and just wiggle? Well, these were about that size, but silver and with a black spot at one end that might have been an eye. I certainly wouldn’t like to have to try and gut one. They were quite crispy and I could pick up about thirty at a time with my chopsticks. That’s how small they were. You could probably get five hundred of them in a matchbox. In the canteen after collecting your lunch you serve yourself with Kimchi from a pot at your table. Kimchi is cabbage in a spicy red sauce. It’s taken me forty five years to finally discover a way to enjoy cabbage, so I’m quite pleased. I’ll be even happier if they start selling it at football games in place of the hot beige flumps. I took my burnt tongue off to the ticket office and bought a ticket for the East Stand for eight thousand won, which is about a fiver. I could have got one for behind the goal in the North Stand for four thousand, but I knew that this was another stadium with a running track around it and I didn’t fancy the extra distance from the action that I would have been if I had gone behind the goal. I dodged the remaining baseballs that were still flying around and went into the ground. I noticed that a lot of the people entering the ground were bringing takeaways in with them and a few cans of beer. There didn’t seem to be any restrictions on what people could bring through the turnstiles or into the seated areas although I didn’t see anyone with a cup of the beige flumps. I was still hungry after my earlier poor choice and so had a look at the options inside. I didn’t fancy the bags of corn snacks and so it was a choice of dried octopus or a cup of something that looked like very thin chips, a bit like the ones that you get in MacDonald’s but much thinner. I watched someone reheating the dried octopus on a small camping stove provided for that purpose and suspected that as you just seemed to throw it over the naked flame that I’d struggle to do it successfully. I went for the skinny chips instead. Bad choice again, they were rock hard, as if they had been inadvertently fried twice, and tasted of nothing but cooking oil. Next time I’m bringing a couple of matchboxes full of those tiny fish. As kick off approached, the ground was still pretty empty. I’d have guessed that there were a couple of thousand in there, mainly in my stand, with two hundred or so behind the goal in the North stand. 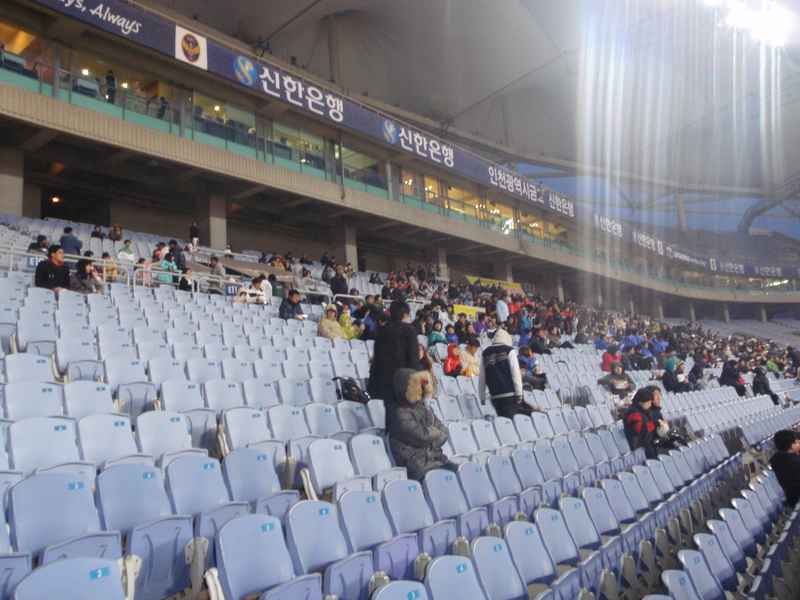 To my left, there were about twenty Ulsan fans and straight across the pitch the West Stand was virtually empty. It was a shame really as it was a very impressive stadium with a capacity of just over fifty thousand, two big stands with much lower ones behind the goals and a roof that appeared to be made of a series of pointy canvas tents. The Incheon fans behind the goal were making a fair bit of noise despite there only being about sixty of them involved in the singing. They had a couple of drums to help them and it looked like some megaphones too. They also had some cracking banners, one of which said ‘TERROR AND TREMBLING’ which I took to be a reference to peoples mental state after the pre-match dodging of the baseballs. 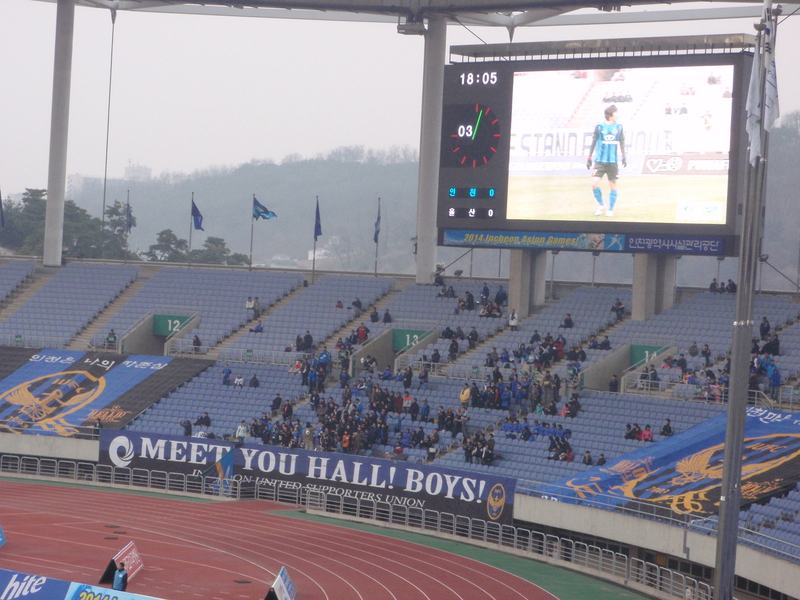 The other banner was a little odd; it was stretched out behind the goal and read ‘MEET YOU HALL! BOYS!’. Yes that’s right, ‘MEET YOU HALL! BOYS!’. I couldn’t decide whether the banner had been ordered over the phone and the line had been particularly bad that day or whether they really were suggesting a meeting in a hall somewhere, a sort of rainy day wet playtime for hooligans. The chanting continued as the teams came out onto the pitch, Incheon in blue and black stripes, Ulsan in the all white kit with the blue tyre tread band that I’d seen them in the previous week at Daegu. The Incheon players each kicked a football into the crowd, one of which came quite close to me and was snaffled by an old bloke who took more delight in his prize than I would have thought possible for someone over the age of ten. 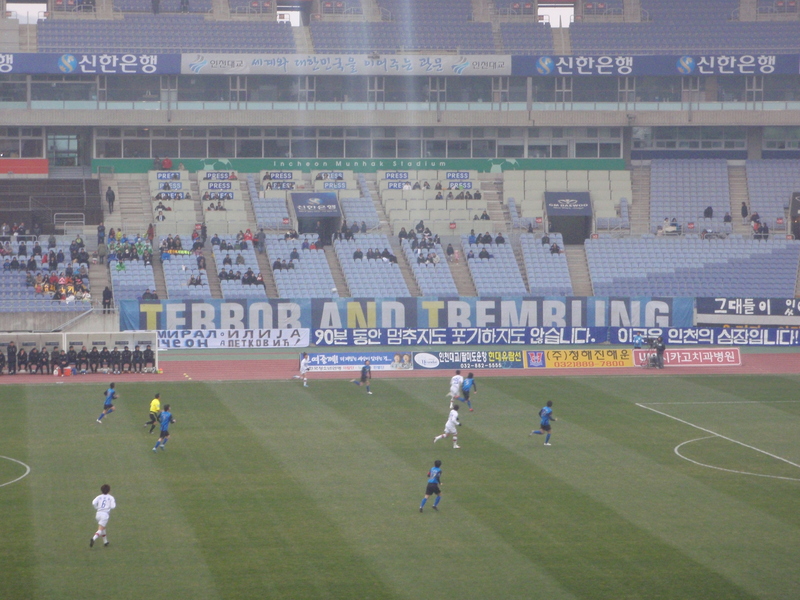 As the match kicked off the Incheon fans began a rendition of a song to the tune of I Will by The Beatles. It went on for a few minutes and seemed to follow the structure of the original song. This got them into my good books. If I’d been behind the goal I’d have just joined in and sang the original lyrics. The Incheon left back and captain caught my eye early on, which was quite a feat as he only looked to be about five feet tall and the advertising hoardings weren’t much lower than that. He looked a good ten years older than the rest of his teammates and a fair bit harder too. I doubt a stray baseball or a red hot beige flump would have caused him much concern. He actually reminded me of a bloke I used to work with and who coincidentally played left back for the works team. I’ll call him Davie, mainly because that was his name. He was as ‘no-nonsense’ at work as he was on the football pitch and was known for pinning up against the wall anyone who gave him a bit of problem. He had a farm as well as a bit of a sideline and one day he was telling me about a sick sheep he had. I asked him if he had called the vet out and he told me that he rarely bothered with that, preferring to dispatch them himself, coshing them on the head with an old table leg. I made sure I never gave him any trouble either on or off the pitch. 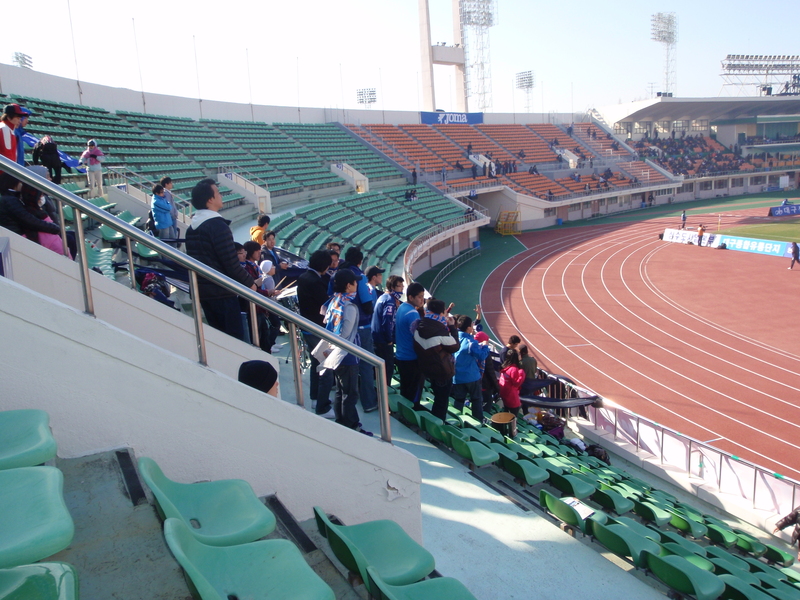 The Incheon fans continued to be in fine voice and switched from The Beatles to a song called Coast Boy. I know this because soon after they started singing it, the camera was turned onto them and they appeared on the big screen jumping up and down. The lyrics to Coast Boy were then flashed up onto the screen with the title in English. It was wasted on the singers as they were directly below the screen and couldn’t see it, but I was impressed to see that it was the bloke who operated the screen taking his lead from the crowd and not vice versa. Coast Boy had barely died down when Ulsan took the lead. The Incheon keeper completely lost the flight of a long range shot and it went straight through his hands. Fortunately he managed to get his face to it, but it was only a temporary reprieve as Ulsan put the rebound away whilst he lay stunned on the turf. Davie, the Incheon left back stood and glared at his keeper, obviously weighing up whether he had time before the restart to nip back to the dressing room for his table leg. Fortunately for their keeper’s well-being, Incheon equalized within about fifteen minutes with a deflected shot from the edge of the box after the Ulsan keeper had punched clear from a corner. That was it for the first half. I went for a wander during the break, mainly to try and warm up a bit as the temperature had dropped quite rapidly. The concourse was full of kids playing football and teenagers swigging beer or soju. Soju is a popular drink over here. It’s a rice based spirit that varies in alcohol content but tends to be about the twenty percent mark. It tastes a bit like vodka, you can buy it in plastic bottles in the supermarket for about sixty pence and it’s ideal for swigging when you need to warm yourself up at the match. Mind you if any of kids in the concourse had decided to play next goal the winner before returning for the second half, or if the teenagers had decided to have one last nip of soju, it would have caused them a bit of confusion. 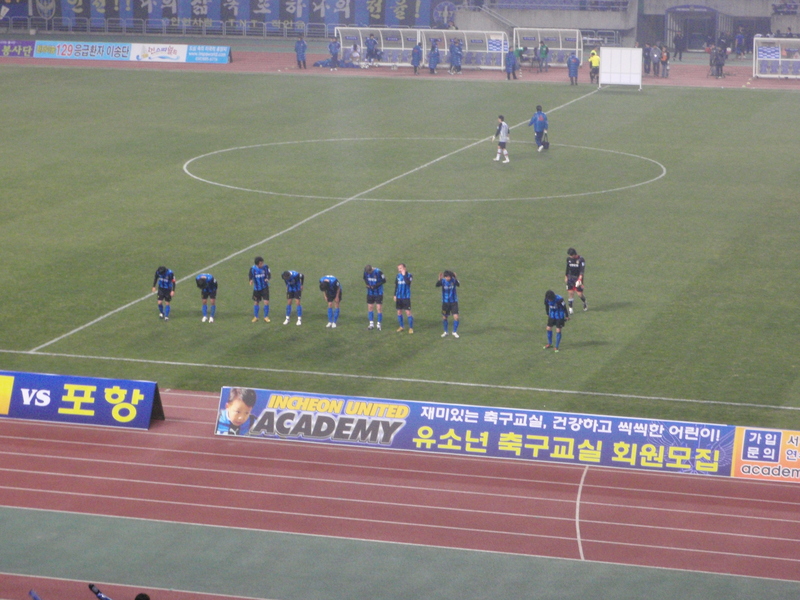 Incheon had barely straightened up from their pre-second half huddle when Ulsan re-took the lead. Anyone getting back to his or her seat a minute late would have seen Incheon kicking off at 2-1 down and would no doubt have assumed that they were watching the start of the second half. Incheon pressed throughout the remainder of the second half despite having their centre half sent off and had a few good chances including hitting the bar with the final kick of the game. 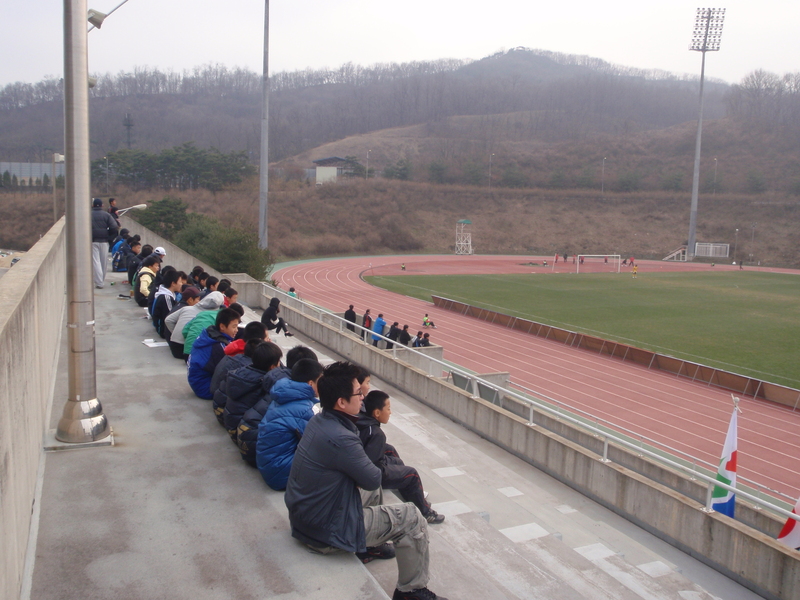 But it wasn’t to be and Ulsan won 2-1 to the delight of their twenty fans. Davie and his Incheon team treated us all to deep and remorseful bows as thanks for braving the freezing cold before I headed off into the dark for the thirty two stop subway journey home. And what of Lee Dong Gook? Well, Jeonbuk Motors didn’t have a game this weekend, it’s one of the drawbacks of having a fifteen team league. They had, however, played the previous Wednesday night in the Asian Champions League, beating a Chinese team, 2-1 away. The Lion King played the whole ninety minutes and notched his first goal of the season for Jeonbuk when scoring an eighty seventh minute winner. Let’s hope that’s the goal that kick starts his season. Incheon Korail against Yesan was the first game in what I remember speedway fans calling a ‘double header,’ two matches back to back, although in this case on different pitches and with far less dust in my hair at the end of it. It was the opening day of the season for the teams in the second tier National League and I was going to watch Incheon Korail before taking in the match between their close neighbours Incheon United and Ulsan in the top division straight afterwards. And when I say close neighbours, I mean it. We are talking maybe forty yards between the two stadiums. It’s quite possible that a defensive clearance from one pitch could find its way onto the other, holding up the game whilst someone either politely boots the ball back or else not so politely threatens to stick a knife in it if it comes over again. Incheon isn’t too far from me and whilst it’s apparently a city in its own right, there doesn’t really seem to be anything separating it from Seoul. 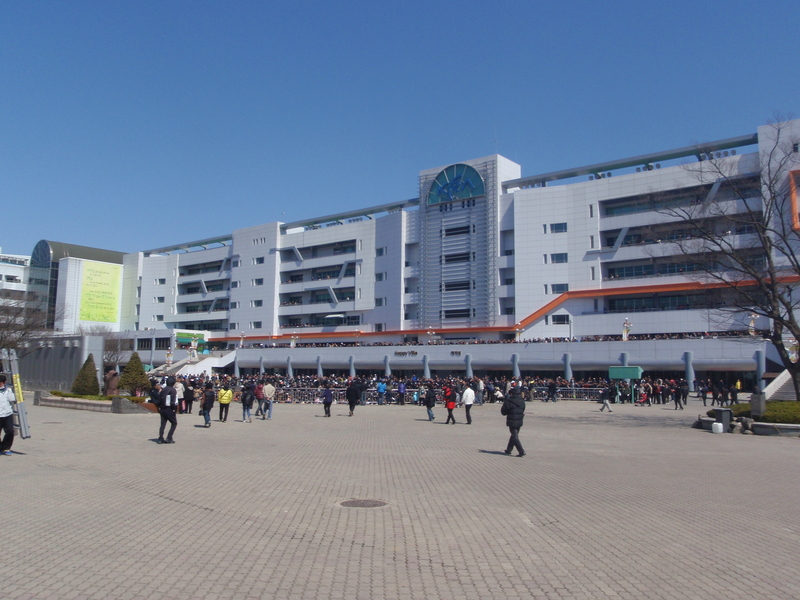 The Seoul subway runs to Incheon and the main international airport for Seoul is situated at Incheon. So with that in mind I didn’t really have a great sense of urgency about setting off for the match, which was a bit of a mistake really. After leaving my apartment at about a quarter to two, I checked my subway map to discover that I needed to change lines three times and travel through thirty two stations. Possibly, allowing an hour and a quarter might have been a bit ambitious. It was extremely ambitious as it turned out and it took me over an hour and a half just to reach the Munhak Stadium subway station. The exit from the station was packed with food stalls, selling the usual fried dough stuff, sushi, dried octopus and some things on sticks that didn’t look too healthy. I was tempted to stop and get something as I doubted there would be much for sale at the Incheon Korail game, but as I had already missed the first twenty minutes I decided to leave it. 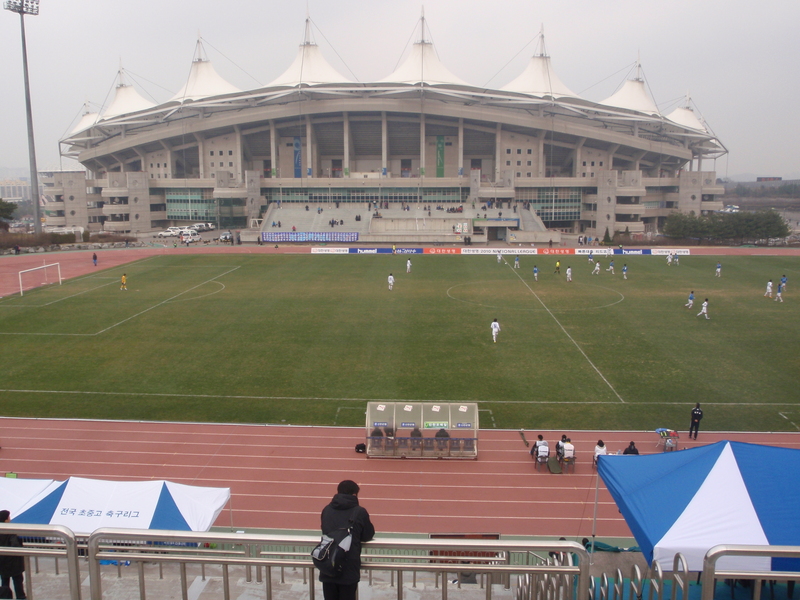 I could see the World Cup Stadium ahead and knew that whilst Korail sometimes played there, today their match was on the practice pitch next to the main stadium. 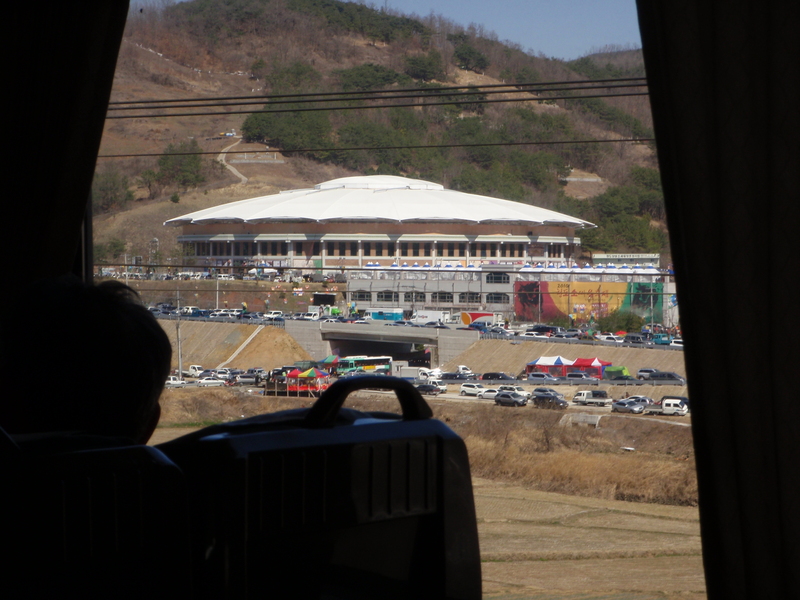 As I walked towards the Munhak World Cup stadium, I could hear the noise of the crowd. I doubted that it would be coming from the practice pitch and for a moment wondered whether I’d got the two kick-offs mixed up and it was actually the Incheon United game that I’d missed the first twenty minutes of. But no, the sound was actually coming from a baseball game in the stadium to my right. It was a different sound to that of a football crowd. I think every time the pitcher threw the ball or the batsman hit it or maybe even every time the beer and hotdog man appeared, everyone in the stadium seemed to shout something at the same time before quickly reverting to general background mumbling. I passed a tout and he offered me a ticket for five thousand won (about three quid). I’ve no idea how much the face value of the ticket was or even how long the game had been going on for, so I couldn’t tell you if that was good value or not. Mind you, for three quid I don’t suppose it mattered much. Good value or not, I turned the ticket down, not so much because I didn’t fancy seeing the baseball, because I did. 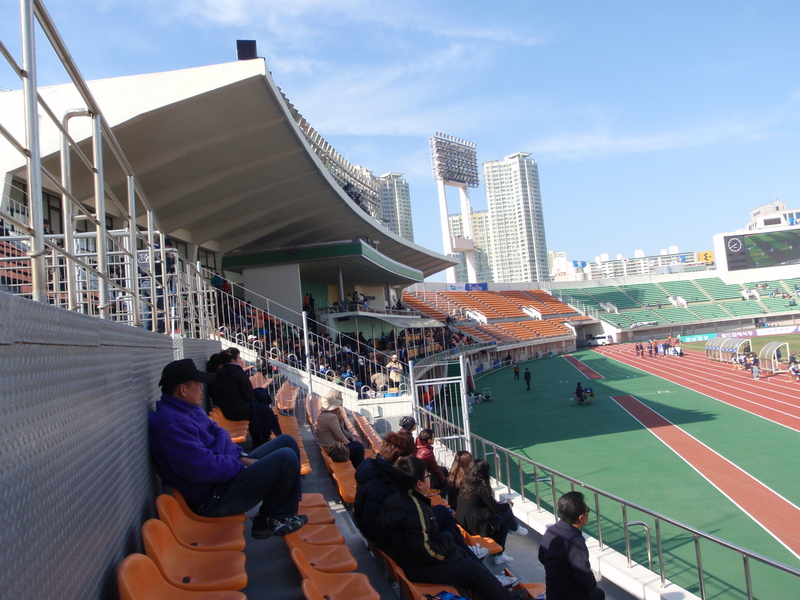 But it could wait, it was the first game of the season for Incheon Korail and I was late. Getting later as well, as the practice pitch was behind the main stadium and so I still had a fair trek to get there. I walked around the main stadium which was pretty quiet. There were over two and a half hours to go before the K League Incheon United game kicked off and the only people around were car park stewards and a few kids throwing baseballs to each other. I dodged a couple of stray ones, baseballs that is, not kids or car park stewards and finally arrived at the Korail stadium ten minutes before half time. I say stadium, but that’s pushing it. There was one quite large stand that could hold maybe three thousand and a much smaller one facing it. The pitch was inside a running track and both ends behind the goals had nothing more there than a couple of ball boys waiting for someone to scuff a shot wide or a lightning bolt to put them out of their misery. I headed for the small stand as it was nearest and I didn’t fancy walking around the pitch whilst the game was on. It was free to get in, or at least it was at three thirty five. If there had been someone taking money before kick off that’ll teach him not to skive off early. One of the reasons that I don’t like being late for matches, particularly matches like this, is that it means that I’ve no idea of the important little details. Important little details like the score for example. I also had no idea as to which team was which. Actually, never mind which team was which; I didn’t even know who Incheon were actually playing. It was a detail that hadn’t really seemed important when I’d set out from my apartment a couple of hours earlier. With that degree of ignorance I wouldn’t have known where to start asking one of the thirty or so people in my stand for information, even if I could speak their language. They would probably have felt compelled to keep on feeding me details to fill the glaring gaps in my knowledge, quite justifiably starting with the day of the week and then progressing to checking my passport and telling me my own name. I suspected that Incheon Korail were the team in all white as they had the KTX logo of the high speed train on their shirts. Incheon Korail are, I’ve read, the oldest team in Korea. With the frequent reorganising of the leagues and the even more frequent relocation and renaming of teams to suit anyone but the supporters, most teams don’t have much of a history. Incheon Korail do though, starting out as the a railway team in 1943 and although they have changed names a few time, as rail companies tend to do, they have been around pretty much ever since. The other team were in blue shirts with white shorts, and as the strips are of no benefit to me in identifying the teams yet, I’ll call them Italy. The stand that I was in didn’t have any seats, it was just concrete steps, perfect for standing, but the other thirty people were all sat down with the exception of two small kids who were walking up and down them as if they were in boot camp. I’d had to stand for quite a lot of the journey on the train so I joined the adults and sat on the steps. Not long after I’d done so the ref blew for half time and I stood back up and walked self consciously behind the goal, wondering if someone would tell me off for being somewhere I shouldn’t without a platform ticket, before taking a seat, albeit still not a real one, in the main stand. It was a much better view from the bigger stand. Not only was I higher up and with the World Cup stadium providing a backdrop, I could now see the scoreboard that was on the other side of the ground. Korean scoreboards are different to ours. They show the scores for each half separately, one beneath the other, and you have to add them up. So, as the second half had yet to start it was showing as 0-0, above it the scoreboard revealed that Korail has won the first half 1-0. Having established the score, I was free to enjoy the second half. Incheon looked to be playing an adventurous 4-2-4 formation, whilst Italy went for a more conservative 4-3-3. A few minutes into the second half one of the Korail strikers, Kim Hyung-Woon, who had been involved in most of their good moves, skillfully lobbed the keeper for the second goal of the afternoon. I was relieved when the scoreboard confirmed that it was 2-0 and not 1-1 and that Korail were definitely the team in white. A minute after scoring though Mr Kim went up for a header and missed the ball, connecting instead with the back of the centre half’s head. That was his afternoon over. I took advantage of the break in play (and of his nose) to count the crowd. If we include the two bored looking cameramen to my right, but miss out the subs and ball boys, there were one hundred and thirty people there. Possibly one hundred and thirty one if the object on the far side that I’d taken to be a holdall was actually a well behaved small child. When the match resumed both sides were playing good passing football but they all seemed incredibly slow, as if they were running on sand. Maybe the lack of pace is what tends to separate the K League players from those in the National League. Although I have to say that I doubt many of the top flight players in Korea that I’ve seen so far would trouble Linford Christie over a hundred metres. Nor his Auntie Agatha either, I would imagine. With a quarter of an hour left Korail brought on Park Yong-Hwan and he brightened the remainder of the afternoon by being incredibly greedy, infuriating his team mates by refusing to pass if there was a option instead for him to blast the ball wide from an impossible angle or try to take on a man too many. With the shouts of the players being clearly audible over the mutterings in the crowd, I’m sure he helped me to learn my first Korean swear words. Towards the end Korail had a player sent off for taking a shot a fraction of a second after the ref had blown for offside. I’m sure the ref didn’t realize that he was already on a yellow when he brandished the second one, but it was too late and he had to get the red out. Lee Gyeong-Min went off like a sulky kid, first pleading, then getting angry, then doing a bit more pleading. He walked incredibly slowly towards the touchline, turning back a couple of times to offer to give up his Playstation for a week if he could come back on, before finally ripping off his gloves and leaving the pitch on the verge of tears to go and tell his Mam about the mean bloke with a whistle. There was a bit of a late rally from Italy in which the Korail keeper took a knock and had to be subbed before the ref brought things to an overdue end and I took a short cut back across the pitch towards the Main stadium and my second game of the afternoon. My next match meant an early morning start, not so much because it was at Daegu, a city about one hundred and fifty miles South-East of Seoul, but more because I was trying to squeeze in a visit to a bullfighting festival at nearby Cheongdo before the game. I’d read about the annual festival in a free magazine that I’d picked up in a hotel and as it seemed to be the only bullfighting festival in Korea I thought it would be a shame not to go and see it. I was up before dawn and out of my apartment just after 6am. I love that time of day when most people are still in bed. When I was a kid I briefly had a paper round and being up and about before everyone else was the thing that I enjoyed the most. Although getting to check out the Page 3 girl every morning ran it a fairly close second. My train was leaving from Seoul Station at 7am and I had to negotiate eleven stops on the subway, including a change of line so I didn’t have a lot of time to spare. I got there with the station clock showing 6.52am and fortunately there wasn’t a queue at the ticket counter. Unfortunately I asked for a ticket to Cheongdu rather than Cheongdo which the girl behind the counter issued very efficiently. Once I’d realized my mistake she just as efficiently cancelled my ticket, refunded my money and gave me the correct one. 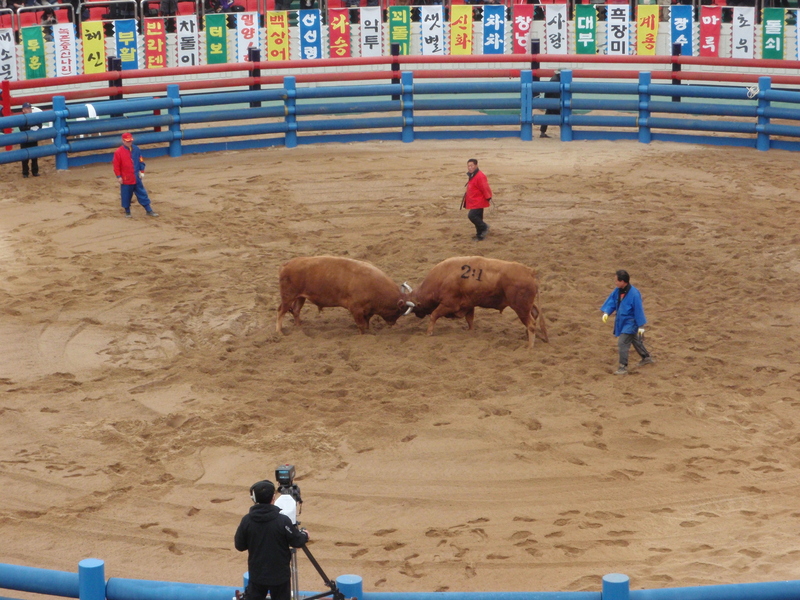 It cost me 59,000 won (about thirty five quid) for a seat in First Class on the KTX fast service to Daegu followed by a further twenty five minutes journey on a local train to Cheongdo where the bullfighting festival was taking place. I could have got there for about two thirds of the price by going Standard Class or even for about half the price if I’d taken a slower train instead, but I fancied sitting in the posh bit and I didn’t really have the time to dawdle along on a train that stopped somewhere every twenty minutes. By the time my ticket misunderstanding had been resolved it was 6.56 and I had to move pretty sharpish to get to the train. It was very smart in First Class with large airline style seats. There were video screens giving you information and announcing the next stops. Nobody checked my ticket, but what they did do was to walk through the carriage, pausing to bow upon entering and exiting, and check that only the seats that were supposed to be occupied were. I imagine that if they found someone in a seat that was meant to be empty, they could check the ticket of the occupant and move him on to his correct seat. The one hundred and fifty miles to Daegu took an hour and forty minutes, which I reckon equates to an average of about ninety miles an hour. It didn’t strike me as being much different to the sort of speed that the trains from Darlington to London do. After a short wait at Daegu I got to Cheongdo at 9.20am. The bullfighting festival was a little out of town and I shared a taxi with a couple of Russian lads, Roman and Ivan, who had been in Korea for a few years. They were both very friendly, Roman seemed especially pleased to have an Englishman to practice his vocabulary on and he wanted my opinion on a variety of aspects of life in the UK ranging from which brand of camera was the most popular to the cost of divorcing a wife. He regarded the cameras as being better value than the wives and told me that he worked in a bakery in Daegu. He liked his job. We got to the stadium with about twenty minutes to spare and Roman, flush with clean money, bought us some tickets from a bloke outside for half face value, 2000 won (about £1.20) instead of 4000. It was the fourth and final day of the bullfighting festival where 132 bulls would fight it out to see which of them was the strongest. I had seen some photos of previous festivals which looked to have taken place around a makeshift outdoor ring, a bit like those photos of prizefights from a hundred or so years ago. Now though, it all happened inside a new purpose built arena, similar to the Spanish rings, but with a complete roof on it. We wandered around the outside looking at the stalls; Ivan pondered whether or not to buy a brass crocodile but settled for two small bells instead. A lot of the stalls sold food, chestnuts, chicken on a stick and pans of bugs, more like maggots or grubs really. A bit of investigation and it turns out that they are Silkworm pupa. They didn’t smell too good and I hadn’t been drinking so easily resisted the admittedly small temptation to try them. At ten o’clock we took our seats for the bullfighting. Each contest was between two bulls who were led into the ring by what I assumed were their owners. Although the bulls were of a similar size to those that take on the matadors in Spain they were noticeably tamer, or certainly more comfortable around humans. The Spanish bulls rarely see humans their entire lives and will attack them on sight. These bulls were led around the ring by a rope through their noses as if they were pugs being taken out for an evening paper. Not that you would have much success trying to thread anything through the nose of a pug, but hopefully you get my drift. On the signal of the judge the bulls would be brought together and they would clash, generally putting their foreheads together and trying to push the other one backwards like kids in the playground or Premiership footballers. Occasionally, one would try and get his horns underneath the others head, or would pull back and try and stick the nut on his opponent. Like most playground fights though, it was mainly pushing and not much else. After a while one of the bulls would decide he had had enough and turn and leg it to the amusement of the crowd and the dismay of its owner. This would mean that the bout was over and he had lost. There was a table full of trophies though so it would appear that none of them had to go home empty handed, a bit like with amateur boxing or those marching jazz bands. The contests were more like Sumo than anything. The first three or four bouts were over pretty quickly but the last one that I saw went on for about forty minutes, by which time both bulls seemed tired and bored and looked to have fairly badly chaffed foreheads. Mind you, I suppose that compares quite favourably with the sort of condition they would have been in after a few minutes in the ring at Madrid. When one of them finally realized that all he had to do to go home was to stop pushing and ask for his party bag, it was all over. All over for me too, I’d seen enough after a couple of hours and it was time for me to head off to the match; another few hours of pushing wouldn’t have added to the experience. I said my goodbyes to Roman and Ivan, got a taxi outside and made my way back to Cheongdo station in the company of a taxi driver who must have just dropped off a fare from quite a distance away as he had little idea of where Cheongdo was, never mind its station. I managed to direct him towards the town as it became apparent just how fortunate it was that I’d got there when I did. The tailback of cars containing people arriving was starting to resemble those at Silverstone or Glastonbury. People were abandoning their vehicles three miles down the road and walking the remainder of the way to the stadium. After a tour of the town we found the station and I made the twenty five minute journey back to the Daegu. We passed the bullfighting stadium on the train and it elicited coos of amazement from the old women in the carriage. They couldn’t have been more impressed if someone had produced a talking dog and it had read the newspaper to them. Once I got back to Daegu I had to find the stadium. It was another of those grounds built for the 2002 world cup and with a 66,000 capacity. I wondered how full it would be with Daegu bottom of the league after three defeats in their first three games. I couldn’t see a World Cup stadium mentioned on the subway map so asked at the information office. The bloke was very helpful and circled all the relevant stops on a map for me. I went to buy a ticket at the automated machine and a few minutes later he came running out after me. “Are you going to the match against Ulsan?” He managed to get across to me with a fair degree of difficulty. He gave me details of a different subway station and I set off thankful that he had made the effort to help me out. I had once turned up for a lower league match in Spain only to discover at ten to three that they had moved to a new stadium the previous summer. The bus and players outside the ground a couple of hours earlier that I had thought was the away team arriving was actually the home team departing for their new ground. I found the correct stadium easily enough this time though after a visit to the tourist information office for a map and some directions. It was much smaller than the World Cup Stadium with a twenty thousand capacity and was right next to a baseball stadium. I didn’t get to find out why Daegu played matches at different grounds, although the World Cup Stadium will be host the World Athletics Championships in 2011, so perhaps they needed to set the hurdles out or something. The prices this week ranged from 7000 won to 10,000 won which is about four quid to six quid. I handed over a 10,000 won note and was given a 7000 won ticket and change. It’s probably worth mentioning the money at this point. Whilst there are apparently some 50,000 won notes in existence, I’ve not seen one so far, they certainly don’t give them out to me at the cash machines. The highest denomination note in common usage therefore is the 10,000 won, which as I’ve said is worth about six quid. 5,000 won and 1,000 won (about sixty pence) notes are also used. The highest value coin is 500 won (thirty pence). The upshot of this is that if you need to carry a couple of hundred quid about with you, you will have a wallet like a Premiership footballer heading for a day at the races or the Aston Martin pimping shop. It was two thirty when I went into the ground and it was virtually empty. There was no roof and it had a running track between the stands and the pitch. I was able to walk around the entire stadium with the exception of the VIP section towards the centre of one of the stands. If only I’d paid the extra three thousand won, that could have been me. I bought a hazelnut flavour coffee but passed on the dried fish and pot noodles and sat down in what was probably the windiest part of South Korea to watch the match. By the time that the game kicked off, there were maybe a thousand people in the ground, twenty or so of them making the noise for Daegu behind one goal, most of whom looked about fourteen and a few of which were girls dressed in matching pink jumpers. I’ve always felt that when I was at that age, part of the attraction of football was that for those who didn’t really fit in anywhere, the misfits if you like, football was somewhere where you could go and be part of a crowd, somewhere where you could feel a sense of belonging, somewhere where you could be rubbing shoulders with the cool kids who wouldn’t have acknowledged your existence in other circumstances. It didn’t matter if you liked the wrong music, had a crap haircut or wore embarrassing trainers, for ninety minutes you belonged; you were all in it together. I’m not talking about me, you understand, I like to think that despite my taste for bands that had long ceased to be fashionable, a haircut that exposed my ears when ears were meant to be covered and then vice versa and trainers that invariable had that crucial fourth stripe, I was, at fourteen, cool enough to get by. However, I’m sure that we all knew people that weren’t and football was somewhere where it didn’t matter. These days it’s slightly different, those that struggle to fit in tend to get their sense of belonging from places like message boards instead where from behind the keyboard they can reinvent themselves online as a cross between James Bond and Lionel Messi. For the fourteen year old lads cheering on Daegu, you could see their sense of belonging, the common purpose and the added bonus for them of having girls in pink jumpers to jump up and down alongside. I don’t remember that in the Holgate end, mind. What more could they ask for on a Saturday afternoon? Well, if I’m being picky, they could probably ask for a defence that could hold out for more than ten minutes before conceding a goal. It wasn’t long before they were one down from a corner and then to make matters worse Won-Keun Jeon managed to pick up two yellow cards within the opening quarter of an hour and was making his way back to the dressing room not so very long after having left it. The fourteen year olds kept up the noise though out, dancing up and down, singing and banging their drums. At half time they opened the gates and tried to entice in the crowd who were leaving the baseball game at the stadium next door. Despite it being free, there only seemed to be two or three hundred takers, most of whom were wearing a baseball mitt. I’ve never been to a baseball game so that’s something else where I don’t know what goes on. Is the glove in case the ball is hit into the crowd? Do they get a prize if they catch it or is it all about glory? How good would it be if fans were actually allowed to catch the opposition out? That really would give people a sense of belonging. Anyway, not many of the baseball fans felt much of a sense of belonging at the football as quite a few came in to the ground, had a brief look around and then left before the second half kicked off with an expression on their faces that you might have expected if Morrissey had inadvertently wandered into a barbecue. The stewards should really have closed the gates once they had got them in. In the second half Daegu equalized against the run of play with the sort of scrambled goal where it looked like they were trying harder not to get it over the line. The pink ladies were ecstatic and I was pleased for those twenty odd fans who had kept up the chanting throughout the match. With a couple of ringleaders with megaphones and at least four drums amongst them, one of which even had a cymbal attached, they had made more noise than I’d heard at most Championship grounds in the UK this season. The Ultras celebrate the equaliser. One of the things that I did notice during the game that seems different to in the UK was that the subs were permanently warming up. Not that half arsed jog towards the corner flag, punctuated by a pause for a bit of a stretch and a chat about spit roasting some girl from Big Brother the previous weekend, but a proper warm up led by one of the coaching staff. They were all ready to come on if needed too, complete with full kit, shin pads and boots. 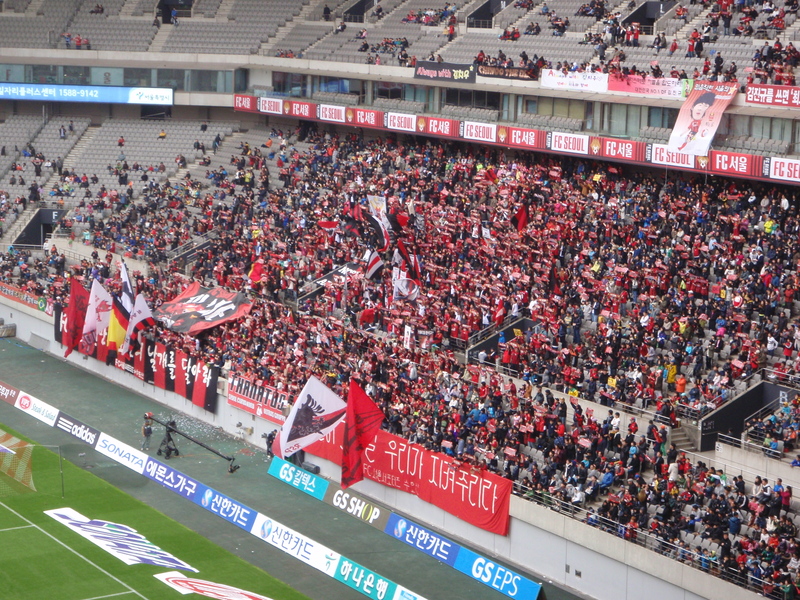 It looked like the Daegu would get their first point of the season and the fans would be rewarded for their support. However, life doesn’t always work like that and with eight minutes left the Columbian substitute Valencia got the winner for Ulsan. Full time and we were treated to an apologetic bow from the remaining ten Daegu players before I wandered out and caught the Seoul train. You knew I’d been dying to get that one in, didn’t you. Meanwhile Jeonbuk had retained their unbeaten record with a last minute equalizer in a 1-1 draw at home to Seongnam Ilhwa Chumna, staying top of the league with eight points from their first four games. Lee Dong Gook had been recalled to the starting line-up and played the full ninety minutes but he didn’t get the goal. With a World Cup coming up in the summer it wouldn’t do him any harm to get off the mark. Next week, I’m off to Incheon which is apparently famous for being the place where General MacArthur landed his invasion force against the North in the Korean War. I’ll be getting there early to watch Incheon Korail play in the afternoon in my first National League match, which is the division below the K-League. Then I’ll follow it up with Incheon United’s top flight game against Ulsan in the evening. My second weekend in Seoul meant my first K-League match. K for Korean I imagine if anyone was wondering. Or maybe not, perhaps it’s sponsored by Kwick E Mart or someone. There are a lot of convenience stores in Korea, so it’s possible. The matches here seem to be spread over the full weekend as they are pretty much everywhere these days, with a game or two on Friday night and the others split between Saturday and Sunday. 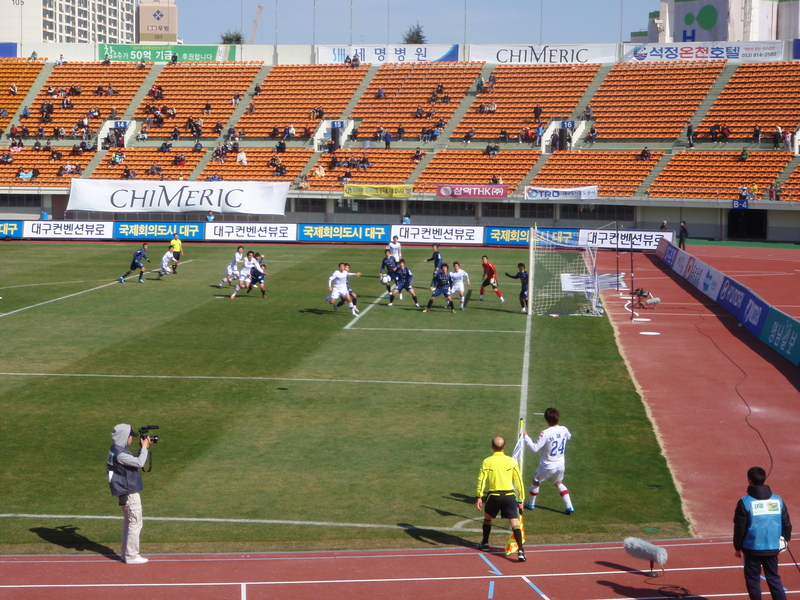 My local team, Seoul F.C, had a game at 3pm on the Sunday afternoon against Lee Dong Gook’s Jeonbuk Motors. The stadium is a fair distance from the city centre, but with a subway station actually called World Cup Stadium, I wasn’t too worried about finding it. I’d actually passed through that subway station the previous day on the way to the hills on the Northern edge of town. I’ve always liked doing a bit of hiking and thought that being out here shouldn’t be any reason to have to miss out. I met up with a group of mainly Americans at a subway station and ten minutes later we were at the bottom of a hill in the Bukhansan National Park. Part of the attraction of getting out into the hills in the UK is the remoteness, the solitude, the chance to get away from the towns and the crowds. Here though, it couldn’t have been more different. The paths were not only extremely well defined, but they were generally fenced in to stop people straying from the intended route. On sections where it got a bit steep, metal cable replaced the fencing, sometimes on sheer sections iron railings were provided to haul yourself up with. Occasionally a knotted rope would be handily placed to help with steep descents. The hardest aspect to get used to though was the number of people. 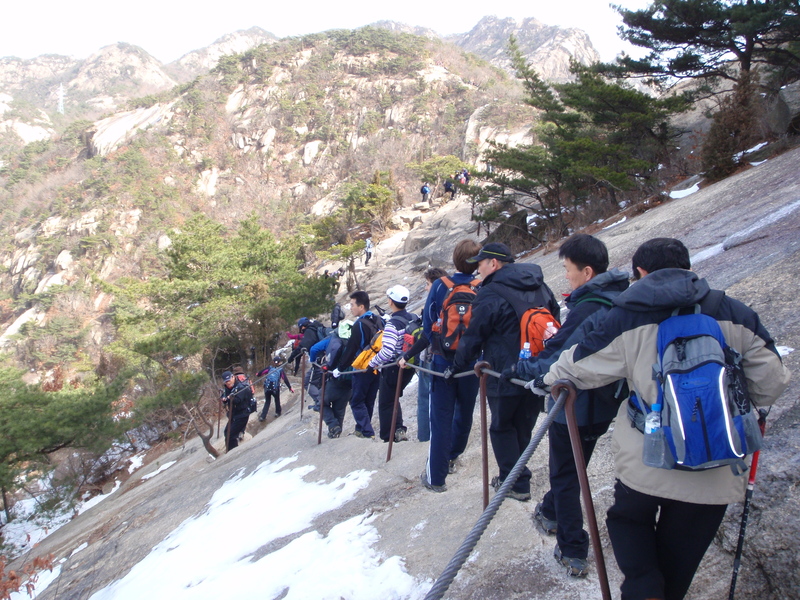 Even though this was apparently very early in the Korean hiking season, the paths were packed with hikers of all ages. Quite often, on a steep section or on a path where the ice hadn’t quite melted, there would be a queue of people patiently waiting their turn to move forward. On sections where the path got a bit wider, groups of hikers would attempt to overtake slower walkers in front of them and a bottleneck would form as the path narrowed again. We got up four separate peaks in the day as we walked from Dokbawi to Munsubung and each one had hundreds of people on the top of them, most of whom had brought elaborate picnics, often with chairs and blankets. I’ve been on some of the more popular Lake District routes in the summer so I know what a crowded peak can be like, but this was something completely different. One of the walkers I was with told me that as the season went on it got so much busier and at its most congested you could barely see any rock for people. I had a good day out, the views over Seoul were fantastic and it was interesting to see the type of terrain in those hills, but it wasn’t my idea of a day out hiking. Still, it’s as near as I’m going to get out here I suspect, so I’m sure I’ll be joining the queues again soon. There were a few polite queues at the subway on the way to the match too, which I found equally unusual. The subway all seems very modern, it’s a bit like that new line in London where the tracks are behind glass. I like that, one of the things in life that makes me twitchy is waiting for a tube train in London at those stations that don’t seem to have changed since the days when Jack the Ripper had an Oyster Card. I tend to stand with my back to the wall to try and discourage those frustrated with life in the Capital from shoving me in front of an oncoming train. I feel a lot more comfortable in the modern stations where the worst they can do when the pace of life down there becomes too much is toss random Northerners against the glass barrier rather than onto the track. In Seoul, there are markings on the floor in front of each of the doors in the glass barrier where the people waiting for the train queue up. I’d always thought Britain was a place that was big on queuing but this certainly beats the sort of scrum that we tend to have on our underground. It beats us for price too, a single journey worked out at about 70p. I’m sure I paid four quid for the opportunity to dice with death last time I was in London. As the train made its way towards the World Cup Stadium I was entertained by a bloke going from carriage to carriage selling some sort of implement for unblocking sinks. He had brought a variety of plumbing with him and was demonstrating how this device would remove the most stubborn blockage in a hundred and one different ways. I have to say I was pretty impressed. But for all that I think he had the wrong crowd. How many people on their way to the match are going to make that sort of impulse buy? If he had been selling them after the game and if you were in a generous mood after seeing your team win then I suppose it’s something that you might buy to take back home with you as a treat for the wife, but honestly, who would want to lug it around with them all afternoon at the match? A little further on, an old lady sat down next to me. Her husband, who looked about ninety, was stood next to her. I got up and offered him my seat. He politely declined. I insisted and he declined just as politely a second time. This was getting a bit embarrassing now, with everyone watching. Again, I was unsure of the etiquette, do people offer their seats to the elderly in Korea? Maybe it is seen as an insult. Perhaps he felt I needed the seat more than he did. I offered one more time and with another big grin he refused. I did think about grabbing him by the lapels and manhandling him into the seat, but I had a nagging thought at the back of my mind that he may have been a retired ninja or something and he might politely extract my eyeballs from my skull with the handy sink plunger and, equally politely, replace them with my testicles. One hundred and two uses for it then. Perhaps that might clinch a sale or two. I reckoned that the crowd on the train had already had enough entertainment with the kitchen sink unblocker for one day though and I didn’t want to amuse them any more than necessary by having a bloke twice my age and half my size demonstrate his plumbing prowess on me. So I sheepishly sat back down to big smiles all around. Fortunately the next stop was the football stadium so I was able to get off pretty sharpish. The stadium was built for the 2002 World Cup, which makes sense really, building it for the following one in Germany would have been a bit of a balls up, and it was an impressive sight. I walked quite a long way around it as I often do and passed a swimming baths and a large supermarket built into the ground level of the stadium. Near the main walkway from the car parks were a number of stalls, some selling food, others replica shirts and one at which people could sign up for season tickets. I didn’t manage to work out how much they cost for the fourteen home games in the season, but there was a decent crowd of people buying them. My plan whilst I’m in Korea is to get around as many of the clubs as possible rather than revisiting the same stadium, so despite the potential savings a season ticket was of no use to me and I made my way up the steps to the ticket office. 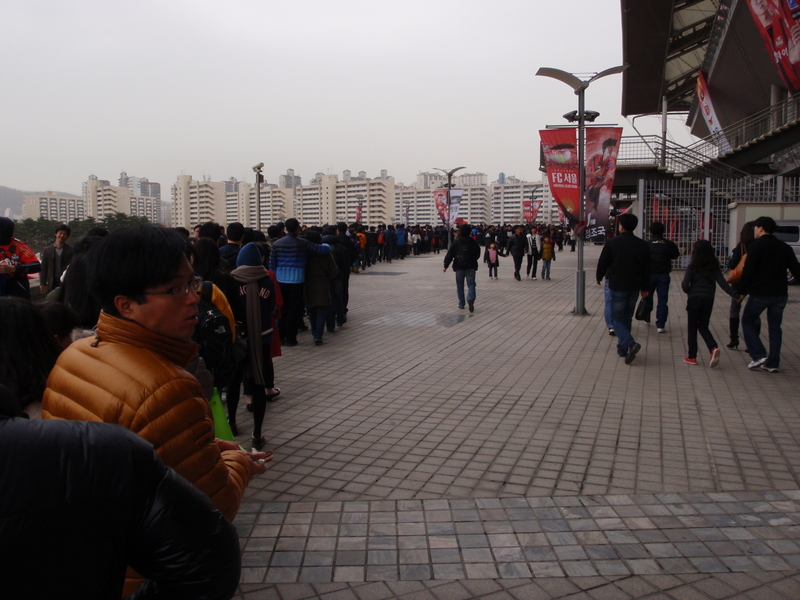 It was fortunate that I’d arrived early as there was a queue that snaked along the concourse for about a hundred yards. It wasn’t quite of the proportions of when we queued for the chance to buy Wembley tickets twenty years ago and the queues seemed to encompass most of Middlesbrough, but it certainly beat anything that I’d encountered on the hills the previous day. The queue moved quickly though and I was soon at one of the eight ticket windows. I had a choice of paying 20,000 won (about twelve quid) for the West stand, 12000 won for the East and South or 8000 for North. I guessed that West and East would be the stands along the sides of the pitch and handed over my 12000 won for a ticket in the East stand. Fortunately the East stand had signs up identifying it and I joined a queue for one of the entrances. A steward, noticing the ticket in my hand, re-directed me to a different queue as the one I’d joined was exclusively for season ticket holders. Ticket scanned, I was soon into the ground and having a look around. There didn’t seem to be any seating details on my ticket, or if there was, I couldn’t read them and so I just sat wherever I fancied. The free seating surprised me a bit as I’d been to the cinema the previous week and was given a ticket for a specific seat. If allocating seats was the norm at the pictures it seemed strange not to do it for a football match. Incidentally at the cinema, I was the third person to go in and my seat was right next to the only other two people in there, a young couple sat towards the back. I was tempted to tell them to behave themselves as I sat down but thought better of it. I suspect they were equally tempted to tell me to f**k off and sit somewhere else, but they must have thought better of it too. The back row of the lower tier of the stadium was designed to accommodate pushchairs and quite a few people had taken advantage of this, turning up with sleeping toddlers. Some of the pushchairs were even loaded up with shopping from the in-stadium supermarket. Coming from a country that rarely seems to make adequate provision for disabled supporters, never mind people with babies and shopping, the arrangements were very impressive. I was right about the East Stand being down the side and it gave me the same view for 12,000 won that the West would have given me for 20,000. 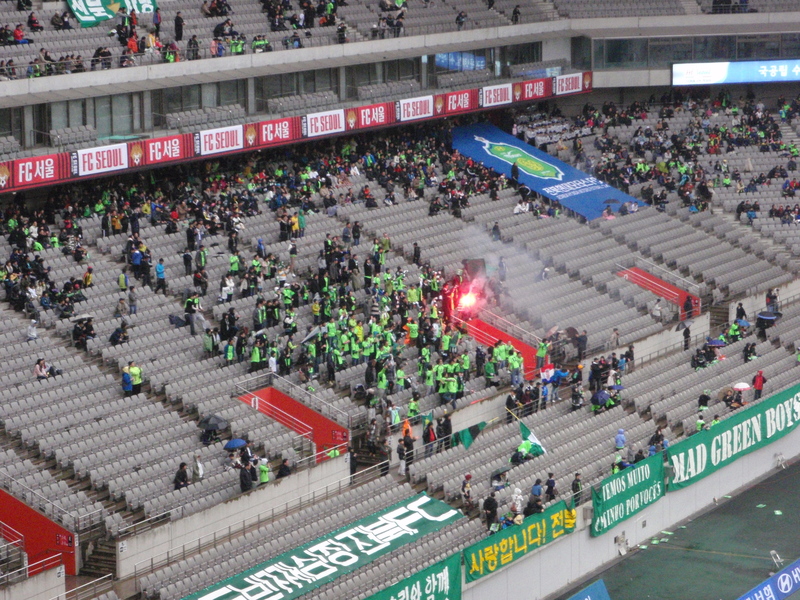 Jeonbuk had a few hundred supporters behind the goal in the South Stand, whilst the Seoul fans that looked likely to be making the noise were in the North Stand. We had a few fireworks in the build up to the game and a girl band called T-ara mimed a couple of numbers as well. They seemed quite popular, a Korean version of Girl’s Aloud or something by the sound of them. I thought I’d occupy myself by trying to work out which one was meant to be modeled upon which Girl’s Aloud band member, but as I’m not actually much more familiar with Girl’s Aloud than I am with their Korean counterparts T-ara, I got stuck after ‘Geordie Racist’ so had to give it up. Never mind though, it was time for the teams to come out. At my club, Middlesbrough, we have Pigbag as the run out song; or rather the run off after the handshaking thing song, as everyone gets the same tune to enter the pitch to in England these days. For those fans at Middlesbrough whose heart has ever sunk at the “Der Der Der Der” of Pigbag, count yourself lucky. The tune that Seoul has somehow appropriated is “If You’re Happy And You Know It, Clap Your Hands”. And they must be, because they did, bless them. The game kicked off to another volley of fireworks, which took me a bit by surprise. Seoul were wearing red and black stripes, Jeonbuk a sort of luminous green. Both teams were well supported by the fans behind each goal who stood and chanted all game. They had plenty of banners, even a flare, which I suspect, given the care with which the Koreans were disposing of their rubbish, was carefully extinguished and dropped into a bin labeled as being especially for incendiary devices. There were a couple of non Korean players, Dejan Damjanovich and Adilson for Seoul, who stood out pretty much because they weren’t Koreans. Lee Dong Gook was recognizable to me putting himself about up front for Jeonbuk. Halfway through the first half it started to rain and a lot of people in the lower tiers migrated to the upper tiers which, whilst still not totally dry, offered a little bit more protection than those seats closer to the pitch. At half time it was goalless and most people around me were eating from little cardboard boxes of sushi or bags of dried squid. I don’t know what Roy Keane would have to say about that. Into the second half and the attendance in the 65,000 capacity stadium was announced as 38,641. I would never have estimated that many people being there. It only looked about a third full at most to me. Perhaps a lot of those pushchairs held twins. With three minutes remaining Lee Dong Gook, who had had a pretty good game leading the line for Jeonbuk despite never looking like scoring, won a header which led to a Jeonbuk goal. The home crowd took it pretty stoically, although a fair few carefully collected their sushi packaging and made their way out. Jeonbuk had a player sent off for something off the ball in injury time but held on for a 1-0 victory and with seven points from three games moved to the top of the league. Before leaving the pitch the players all lined up for that organized handshaking thing that they do before kickoff and then the Seoul players made a point of walking to each touchline, lining up and bowing together to the fans. I can’t see that catching on in Middlesbrough after a defeat. The standard of football didn’t seem a whole lot different from what I’d been watching in the Championship with the Boro this season, no real outstanding players, plenty of mistakes, but with no-one seeming capable of punishing them. I decided to avoid the crowd at the subway on the way out and had a look around a market near to the ground. In addition to the stalls selling vegetables and filleted fish, there were a lot of live fish in tanks. It looked as if a few of the Koreans were just killing time too, some with kids treating it a bit like a trip at the zoo. I remember doing a similar thing with my Dad on a Saturday morning at Stockton market as a kid. Whilst my Mam did the shopping, we would always go and have a look at the pet stall and then call into the indoor market under the town Hall to see the dead rabbits hanging from the hooks. Whilst it might not have been Flamingo Land, it was better than trailing around the other stalls with my Mam whilst she looked in vain for one selling something that could unlock a sink in a hundred and one different ways. Next week it’s a trip down south on the Korean version of the ‘bullet train’ to see a bullfighting festival, yes really, and then bottom of the table Daegu taking on Ulsan. During my first weekend in Korea I didn’t get to see a football match. I’d had a bit of an eventful night out in one of the livelier parts of town, Itaewon, on the Friday, followed by having to view a few apartments on the Saturday whilst nursing a hangover. The combination of the previous nights drinking, no breakfast and a touch of car sickness was making me a little nauseous and was introducing a note of tension to my apartment search. I don’t know what the house viewing etiquette is like in Korea, but certainly back in the UK if you asked to use the bathroom whilst looking around and then vomited loudly in their toilet, you probably wouldn’t be regarded as a particularly desirable tenant. Even less desirable if you failed to reach the bathroom and just hurled your guts up in their front room. But what would you do then, particularly if you didn’t speak a word of Korean? Just smile and shrug, perhaps? How about bowing? I’ve already noticed that they do that quite a bit over here. But if so, how deeply? I read in one of the guide books that the full bow to the waist is rarely used in Korea these days and it’s more usual now just to lower the head a bit. Well, if you have already lowered your head once and deposited the previous evening’s noodles across their polished wooden floor then I doubt that looking like you may be doing it again is going to make amends. Perhaps a quick nod of the head and then running for the door would be the best option, particularly if your potential landlord felt obliged to politely return the bow before grabbing a kitchen knife and giving chase. The downside with attempting a speedy exit though is that with all of the apartments I’d seen I’d had to take my shoes off before entering. It’s not easy to make a quick getaway when you are struggling to tie your laces. Fortunately I managed to stave off the urge to vomit and after viewing four apartments and enduring four traffic jams I found one that would do. So, with the accommodation for the next nine months sorted out, what to do for the rest of the weekend? I’d checked the fixtures for the Sunday games and saw that the club that is nearest to me, Seoul F.C, was playing away. Not really knowing where the other clubs were, or even how to use the subway yet, I thought I’d leave the football for a week and just have a wander around. 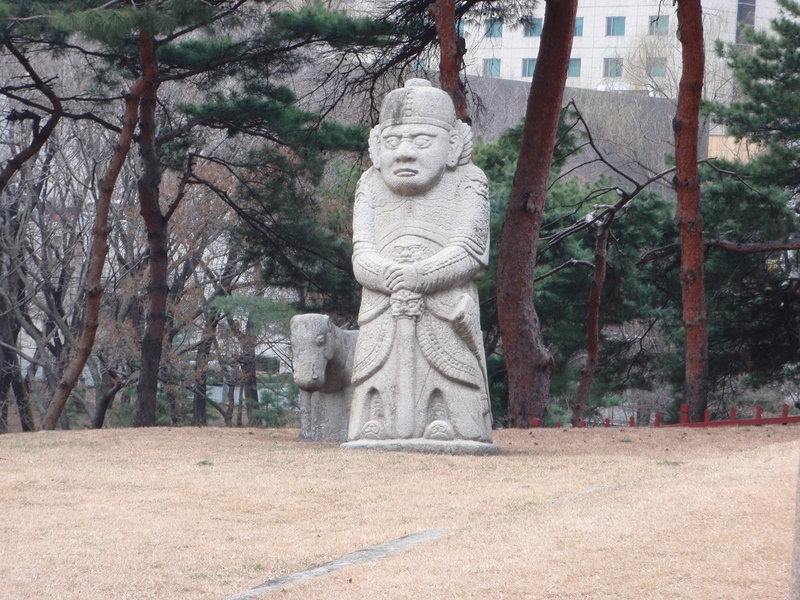 There were a couple of places in the guidebook that were reasonably close to my hotel, a Buddhist temple at Bongeunsa and the tombs of some of the long dead Kings and Queens of Korea. I had a walk along to the temple first and discovered that rather than it being one big building, it was actually a number of small temples on the same site, some no bigger than and bearing a remarkable resemblance to a garden shed. The various temples seemed very similar to each other in that they were all just rooms for praying in. That’s the nature of temples I suppose. I’m not really one for praying, but I am one for noseying around. First though, I had to take my shoes off again, that’s even more of an important thing in temples apparently than it is in apartments. There weren’t any security lockers or places to exchange your shoes ‘ten pin bowling style’ for a pair of slippers. Instead you just left them outside the door of the temple with everyone else’s and went inside in your socks. I left my size twelve’s alongside a few dozen pairs of much smaller footwear and went in. The inside of the temple was pretty much like any church hall or community centre, that is with the exception of the three great big gold painted Buddha’s that filled one side of the room. We didn’t have anything like them in the church hall at home, which is probably just as well really as there wouldn’t have been much space left for the ping pong table. There were about fifty people sat or knelt on the floor, bowing or praying, possibly even both. I stood just inside the door, watched for a while and said a brief prayer asking that nobody would be led into temptation to have it away with my shoes and then I slipped back outside again. The power of prayer is obviously pretty good in Bongeunsa as my shoes were exactly where I left them, possibly helped by them being a good three or four sizes bigger than anything worn by any of the other worshippers and also them being a whole lot scruffier than most of the other footwear. I’m a bit doubtful as to whether you could leave your shoes like that in the UK. You certainly couldn’t have done it in Norton when I was a kid. The temptation to swap all the shoes left by the congregation outside of St Joseph’s church with those left around the corner at St Mary’s would have been too much for us to resist. Even if we couldn’t have been bothered to move a sackful of shoes then I’m sure we would have found time to carefully distribute a box of eggs into the toes of some of the shoes before retiring to a safe distance to watch the fun unfold as the worshippers attempted to head for home. Some people thinking about sneaking eggs into other people's shoes. I read afterwards that had I been in town a few weeks earlier then my shoes would have been at much greater risk. In February the Korean Police had arrested a man who had managed to steal 59,000 pairs of shoes from outside temples and restaurants. That’s what happens when sticking eggs into shoes as a child goes unpunished. I’ve no idea whether he only stole shoes in his own size that he intended to wear or whether he had a bit of a thing for something like bright red stiletto’s with 6” heels. 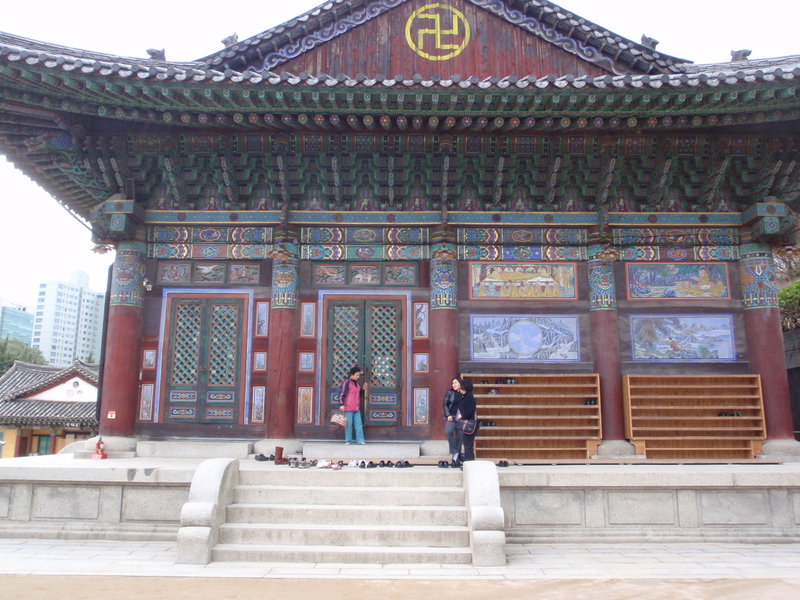 Mind you, I didn’t notice many pairs like that outside of the temples, although perhaps every pair that had ever been sold in Korea was currently bagged up as evidence at the Seoul cop shop. Still, a bloke needs a hobby I suppose. With the shoe robber no longer much of a threat I wandered further up the hill, glancing into those temples where the door was slightly open and I could see what was going on without having to untie my laces again. It was mainly just more bowing and praying, so I continued up to the top of the hill to see the great big Buddha. I wasn’t overly impressed; it looked quite recently built and was possibly made of concrete. It was about sixty feet high however, which I suppose was relatively noteworthy in a country where the average person seems to be about five feet tall. Some people were lighting candles in front of it or burning incense before saying more prayers. I did a quick circuit of it, headed back down the hill and exited past the gift shop, slightly disappointed that despite one of the temples reputedly dating from the mid nineteenth century, nothing that I’d seen looked to be remotely old. 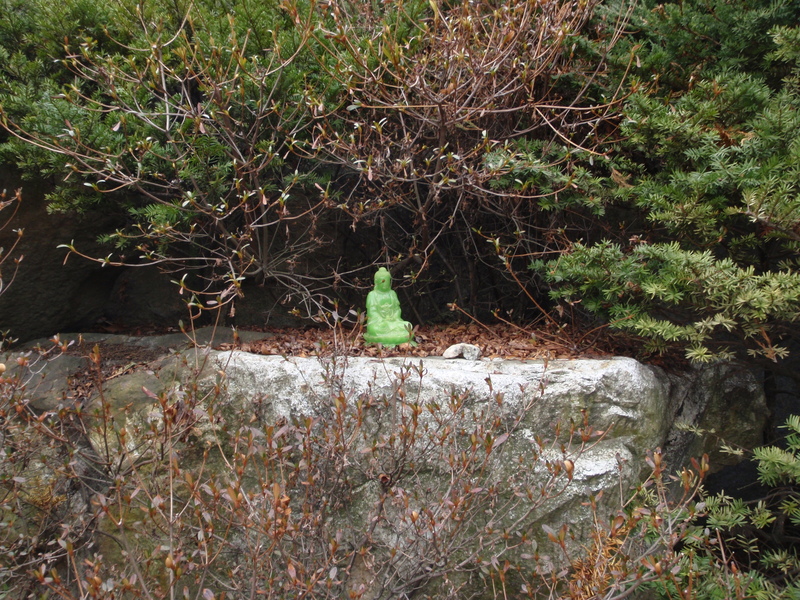 It was more like a Buddha Theme Park than a historical site. The best thing about the Tomb of the Eagles though was that on the windowsill of the farmhouse conservatory were a few artifacts that, unlike in most official museums, visitors were allowed to handle. As well as a collection of eagle bones and some bits of pottery, there was a human skull which we passed around between us. It was a little bizarre really, how old do corpses have to be before it becomes acceptable to dig them up and toss them around for amusement? I think I would rather I was left in peace. I’d always thought I’d like one of those Zoroastrian ceremonies, where you are just left out in the open and the sparrows snack on you until you are gone. That’s got to be better than waking up from a deep coma six feet under or just as they are turning the gas up at the crematorium. Or at least I did before I saw a programme about it on the telly. There’s nothing peaceful about it. In an effort to speed things up the deceased had his legs, arse and back scored with a knife, possibly, I speculated, with the Zorro ‘Z’ and then a flock of vultures descended and tore him apart in about an hour. If he had had his flesh stuffed with rosemary and garlic I wouldn’t have been surprised. So, after seeing that, my current preferred method of disposal is to donate my body to one of those Forensic Science study places where they just leave you out in the garden to measure the rate of decomposition. That seems much better than waking up after a misdiagnosis and discovering yourself in a coffin with nothing more than an old football programme to read or finding some Tibetan funeral director stuffing herbs into the cuts in your back. 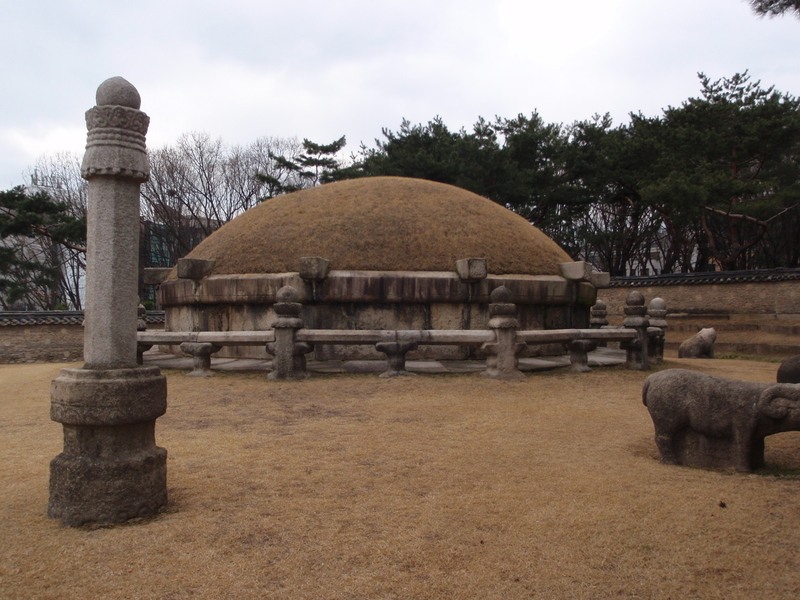 Anyway, I’ve digressed a bit, so back to the royal tombs in the park in Seoul. There were a few of them and whilst some were as indistinguishable from the park keeper’s sheds as the temples at Bongeunsa, there were three quite good ones. Just mounds really, no eagle or monk bones to see, but plenty of statues around them and about five hundred years old. It wasn’t difficult to imagine how the park would have been in those days, which for those with an especially limited imagination, was pretty much the same as it is now. There weren’t many other people wandering around from tomb to tomb, but of those that were, a surprising number of them were wearing surgical style facemasks. Perhaps M*A*S*H had been a bigger influence on the place than I’d thought. The masks seem pretty popular in Seoul, they sell them in the little corner shops alongside the sweets and the pot noodles. Coupled with a hat pulled down over the eyes it meant that most people were fairly well disguised, which I suppose is ideal for them if they were planning to nick your shoes. It struck me that if Michael Jackson had ever moved here he could have blended in perfectly with his hat and mask. He could have gone about his business in complete anonymity as long as he had managed to resist the urge to break into a verse of Billy Jean, moonwalk down the High Street or invite small boys back to his apartment to stroke his monkey. Meanwhile, about three hundred miles to the South, Jeonbuk Motors were playing away to Jeju United in their second league game of the season. After failing to score in his club’s opening league match or in the midweek Asian Champions League game, Lee Dong Gook had been dropped to the bench. He came on as a second half substitute but he didn’t manage to get a goal in what finished as a 2-2 draw. But I guess that if you are a Boro fan, you could have seen that coming. Next week though, it’s the Lion King in the flesh as Jeonbuk Motors visit Seoul and I get to see my first live K-League match.